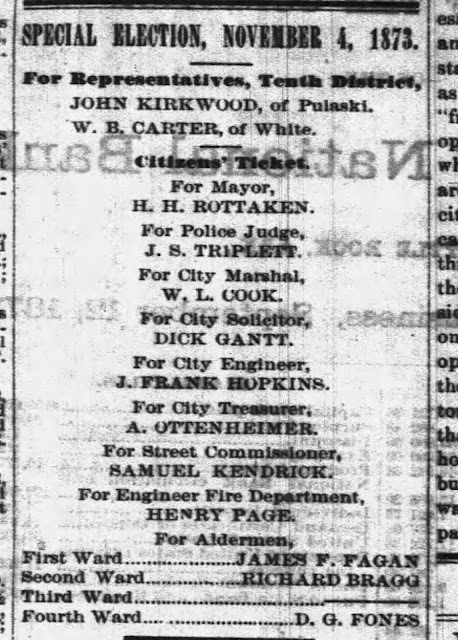 I have attached a link to the recently completed draft of the third paper in a trilogy related to the early political and governance career of Frederick Kramer, a German immigrant who settled in Little Rock in 1857, had success as a businessman, and was a republican-backed candidate for the Little Rock school board, city council, and mayor. In running for, and winning, these positions, he was forced to to swim in the bubbling cauldron of local reconstruction politics. The first paper examined the 1870 Little Rock election and the attempt of Republican brindle-tails (a pro-civil rights faction of the party) to steal it. Specifically, it is the story of the attempted "usurpation" of the vote in the city election, followed by a scheme to 'usurp" the city council to install the faction's preferred candidates for ward 1 and ward 3 aldermen. The usurpation attempts were led by Little Rock''s mayor at the time, A.K. Hartman, a brindle-tail, who wanted to insure the defeat of Kramer, a fellow Saxon, who was running for ward 1 alderman. Kramer was supported by the Republican Party's minstrel faction and was viewed by Hartman as a political enemy. The attempts to "usurp" the election led to some interesting drama as the two factions plotted against each other. 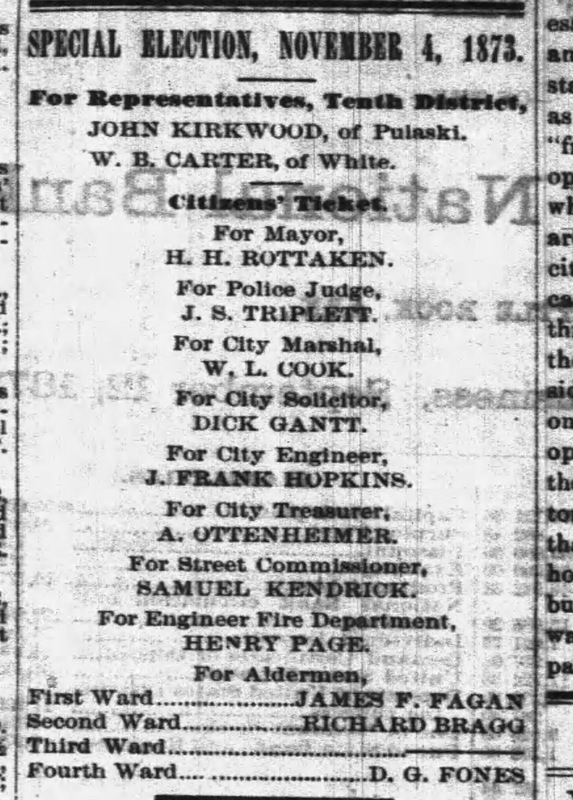 The second paper tells the story of the selection of the Little Rock city council president following the 1871 election. The election had been a successful one for the brindle-tails, and they held four of the eight council seats. 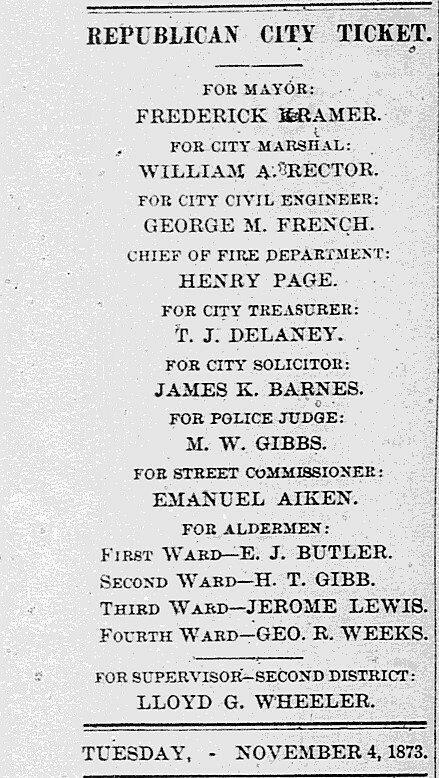 These four brindle-tail aldermen put forward their candidate for the position. The other four members of the council were minstrels, and they wanted Kramer to be council president. The position was considered important because a year earlier many of the mayor's powers had been stripped from him and given to the city council president (mainly to punish Mayor Hartman for his actions against the minstrels). In the course of trying to elect the new city council president, the city council voted 701 times in one day on who should hold the job. The result led to some hard feelings and Kramer's decision to abandon politics for a year. The third, and recently drafted, paper covers the period from the November 1873 election in Little Rock until the election in April 1875, this one under a new state constitution that had been written and adopted after the Brooks-Baxter War (April 15 - May 15, 1874). 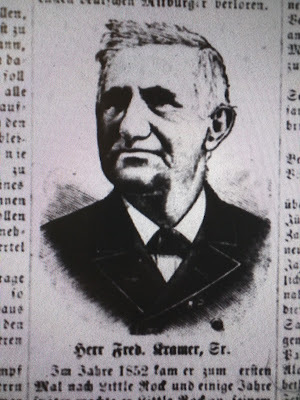 The first part of the paper is about the 1873 election in which Kramer beat H. H. Rottaken, the candidate of the Citizens' Party, a surrogate for the Democratic-Conservative Party. The second part examines the administration of Mayor Kramer whose term was a challenging one because of the War, but also because the city had been slammed by the front edge of the 1873 depression a few weeks before the election. During his term, Kramer was chief executive of a city that could not pay its employees for months at a time. As the city battled its desperate financial situation, Mayor Kramer -- who was the city's chief law enforcement officer -- battled fakirs -- con men -- who had infested the city, and he led an experiment with a voluntary police force. The paper ends with the April 1875 election. With the Democratic-Conservative Party ascendant, Kramer sought the mayoral nomination of that party, but lost. Then he refused the Republican Party nomination, which nevertheless put him on the party's ticket. Kramer announced that he was going to vote for the nominee of the Democratic-Conservative Party, and the republicans suffered a complete humiliation at the polls. With that election, the democratic-conservatives had "redeemed" the city of Little Rock, making Kramer the last reconstruction mayor.